Once Halloween ends a lot of people are ready to rush right on to Christmas, but I love taking a pause to focus on gratitude and turkeys! 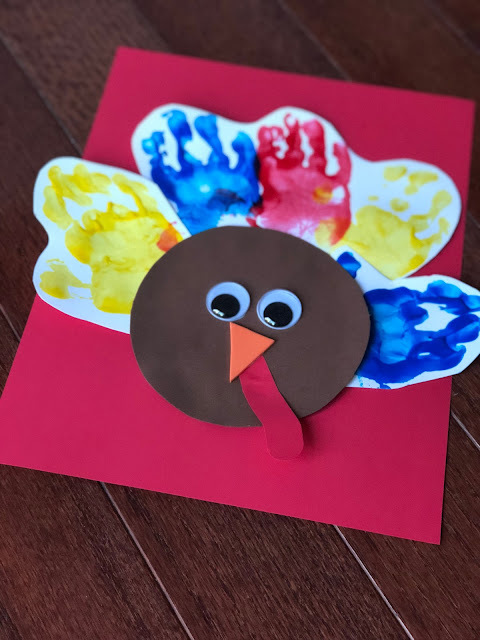 We have so many favorite simple Thanksgiving crafts and activities for toddlers that we've posted on the blog over the past few years. 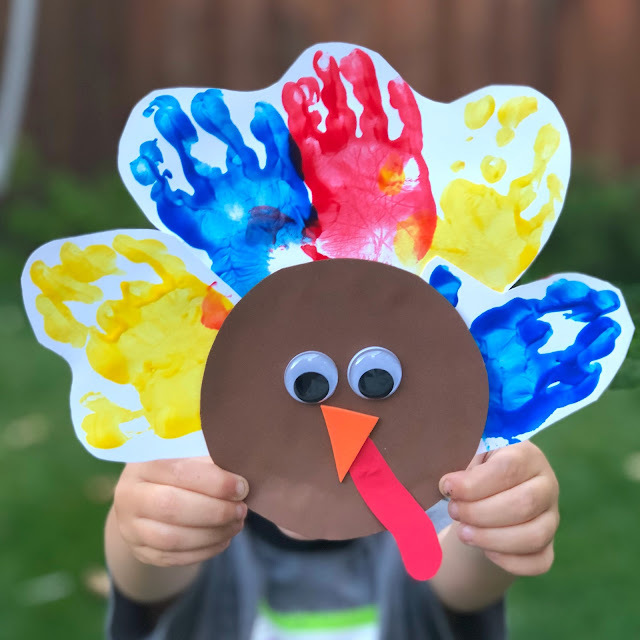 Today I wanted to share an easy handprint turkey craft idea that only takes a few minutes and is a fun keepsake as well! To make this turkey craft you start by getting out a bunch of washable paint and letting your toddler explore and make a big mess! 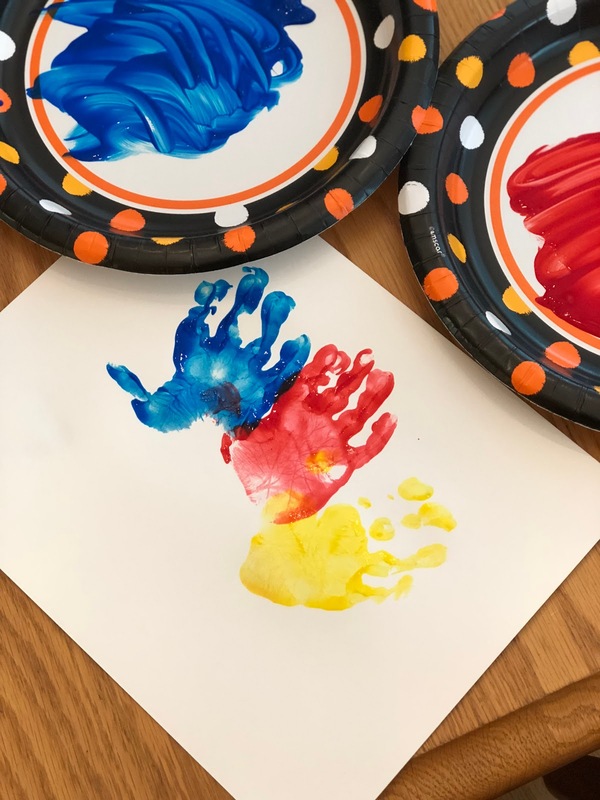 For handprint crafts where I want to actually be able to tell that it is my toddler's handprint, I lay out three pieces of cardstock and I help my toddler dip her hand in one color paint. Then I help her press on white piece of cardstock once time to get some of the paint off. 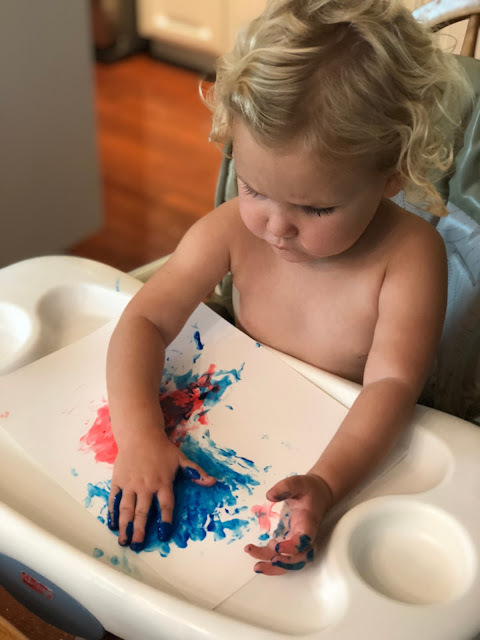 Then I have her do a quick handprint on another piece of white paper (that's the one I keep for this project) and then I hand her a piece of white paper and let her stamp and make a big mess with all of the other paint on her hands. Then we start over again with a different color. Eventually I have 5 different colored handprints that look pretty defined and we have a bunch of papers that were just for exploring color. As we work on one color at a time I love to say the color and have my daughter practice saying the color's name too! This photo below shows our paint exploration phase #3! 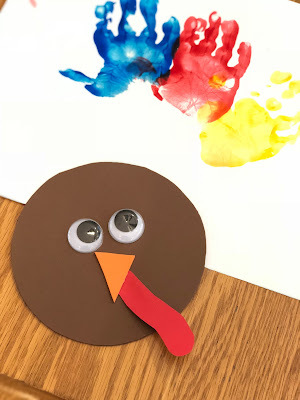 Once I have a bunch of handprints, I set them aside to dry and while my daughter creates a bit, I make the round turkey face with googly eyes and a beak. If your toddler is older or you have a preschooler, they can do this part themselves! I just use glue and cut the materials out. The final step of this project involves cutting around all of the painted handprints and then glueing a big brown turkey face on top of the handprints to hold them all together. Once they are all together, they look like a bunch of turkey feathers! You can either mount your turkey on a piece of cardstock to hang it... or leave it unmounted. My daughter thought the googly eyes were hysterical! I love doing handprint crafts during the holidays because they are so fun to hold onto and look at year after year... it is amazing how quickly kids grow! 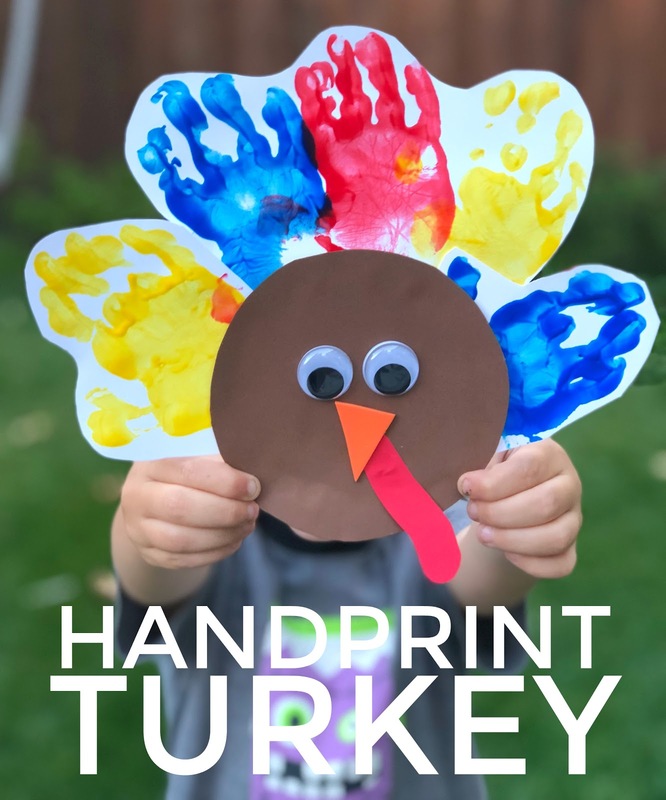 Have you ever tried a turkey handprint craft with your kids? I loved these turkey handprint popcorn gifts we made a few years ago for friends. Check out more of our favorite Thanksgiving crafts and activities over on our Thanksgiving Pinterest board!